Skiers know Oberstdorf and the nearby Austrian Klein Walser Valley as major winter sports centres, the site of a ski jump arena and a number of cable cars and chairlifts. 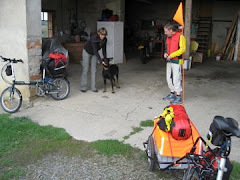 In summer it is a good area for mountain biking, cycle touring with or without E-bikes. The glaciated landscape with hanging valleys and moraines means that there are many short steep climbs interspersed with longer more gentle ones. Judicious use of the power control on a pedelec could make cycling a lot more pleasant. Local pubs and cafes offer free charging while you enjoy lunch or snack. We are here enjoying a few days walking in between the rain and snow storms, but took the chance to check out the town's bike hire facilities. Zweirad Center Hasselberger, Hauptstraße 7, 87561Oberstdorf, T: +49(0)8322 4467, F: +49(0)8322 8932 has touring bikes (9€/day), mountain bikes (12€/day) and E-bikes (20€/day) for hire. There is a Movelo hire point offering Swiss Flyer bikes. These have the advantage that 26 hotels, cafes, campsites and bike parks in the region will exchange your exhausted Movelo battery for a freshly charged one free of charge, which means you can spend more time touring and less time sitting on a terrace in the sun looking at the mountains. The company also offers E-bikes from other manufacturers: Focus and Kalkhoff and a large range of special vehicles: E-mountain bikes, trikes, tandems, tandem trikes, electro wheel chairs, sociables, bike wheelchair combinations, children's trailers, children's seats and dog trailers. E-Bike Verleihcenter Oberstdorf, Bahnhofsplatz 1 a, 87561 Oberstdorf, T: +49(0)8322 95290, F: +49(0)8322 95290, info@e-bike-allgaeu.de, www.e-bike-allgaeu.de (only in German), Open daily including on public holidays from 9am to 1pm and 2pm to 6pm. Opposite the railway station.